Good morning. I hope you all had a great week. I was on vacation with my family in Asheville, NC, and we had a great time hiking, rafting and touring the Biltmore Estate. I didn't get tons of time to read, but I did make good progress with Someone Knows My Name by Lawrence Hill. I would probably be done with it if I wasn't distracted by watching the Olympics this weekend! I put up two reviews this past week. I still have four more reviews to do. I hope to write at least two or three this week. I will catch up eventually! My son finished Gregor the Overlander by Suzanne Collins. He has Gregor and the Prophecy of Bane ready to go so I'm sure he'll be starting that tonight, if we don't end up watching the Olympics all evening again. I'm still reading Someone Knows My Name by Lawrence Hill. I also picked up Eats, Shoots & Leaves by Lynn Truss on a whim. I've been wanting to read it, so I couldn't resist when I saw it on the display shelf at the library. Yes, I'm back to reading two books at once!! I'm going to read Play Him Again by Jeffrey Stone next. So what did you think of 50?? I liked it but a ton of people haven't...although I think the second one is my favorite! I didn't like it enough to read the rest but I have heard they get a little better. I know what you mean about the Olympics cutting into reading time. I have been watching a lot too. Here is my Monday Report. Happy reading! I just figure the Olympics are only temporary so I'll get back to reading once they're done! 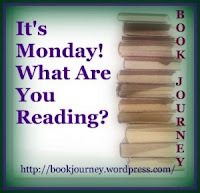 Enjoy your reads this week as well. Eats, Shoots & Leaves is a great book, hope you enjoy it! Enjoy the Olympics and the books you choose. I sent Heath your link. Thanks for passing that link along to him! You're smart! I think I'm more into it this year because my kids are interested for the first time.